Our popular School Holiday Camps cater to all abilities and a wide age range (3 year olds all the way through to 16) so there is something for everyone. Be sure to get in quick before they fill out! 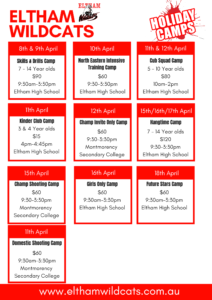 For more information please contact jordan@elthamwildcats.net.au.